Our START workers and clients are participating in the 3rd Annual Recovery Run in September. The run is sponsored by the Brown County Board of Mental Health & Addiction Services. 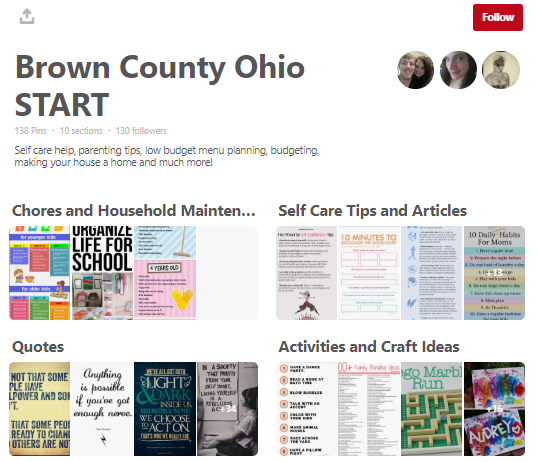 Workers have created a Pinterest Board highlighting low-cost activities for children, menu planning, family activities, and parenting tips. We provide a letter to clients to let them know about the board. We have 130 followers! Click the image to go to Pinterest to see the full Board which contains additional sections. START workers are starting a clothing program to assist in obtaining appropriate clothing for court and job interviews. This is a new resource in our county! START Workers are in the first phases of planning a mentoring program for parents in the community. We also create a START binder that is specialized for each member. This is meant to be a resource and a memory book. It includes sections such as, “My Journey,” Scheduling, Contact Information, Legal, Goal Setting, Recovery/Treatment Information, Self, Health, Family Finance, Education, Resources, and Crime Victim Information. Click here for an outline of contents. Click here for the cover pages that we use for each section. Posted by kranich.1 at 5:00pm July 10, 2018 Posted in County Experience, Innovation and tagged Brown, Engagement, Resources. Bookmark the permalink.